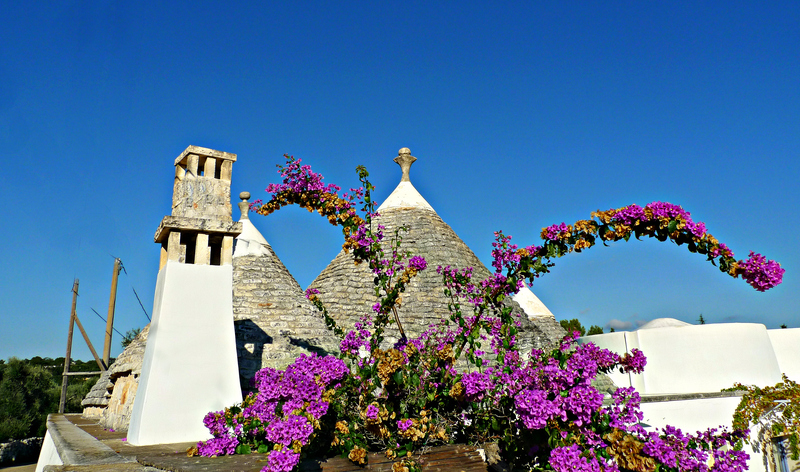 A trullo (plural trulli) is a traditional, stone dwelling which can be found in Puglia in southern Italy. 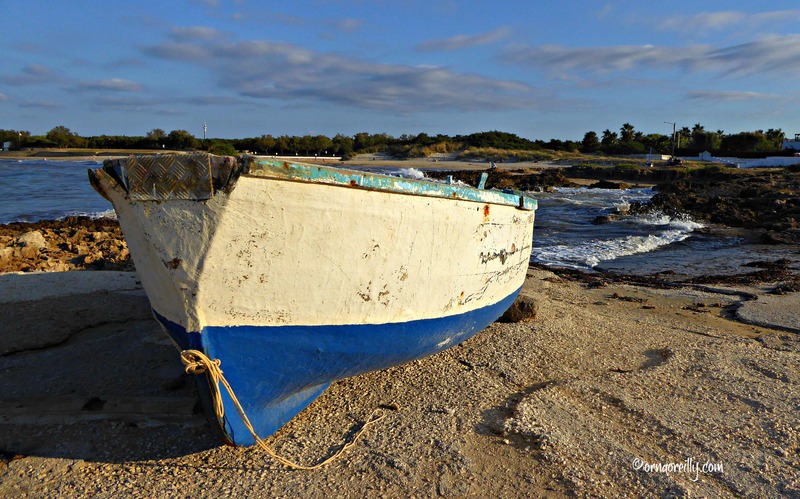 Puglia is a long, narrow region in Italy, which reaches from north of the hilly Gargano peninsula all the way down to the ‘stiletto heel’ of Italy’s iconic boot-shape. This includes the Salento, famous for its stunning beaches, which comprises most of the ‘stiletto’ beginning around Ostuni to the east and Taranto to the west. Not much more than 50kms wide, this pretty peninsula is flat and covered in olive groves, ending where the Adriatic and Ionian seas meet at Santa Maria di Leuca. North of the Salento peninsula is the tranquil Itrian Valley, situated on a limestone plateau known as the Murgia. The main towns of the Itrian Valley are Cisternino, Alberobello, Locorotondo, Ostuni, Martina Franca and Ceglie Messapica. Dotting the verdant landscape of the Itrian Valley are strange, round stone-built houses with cone-shaped roofs. These little houses are called trulli. 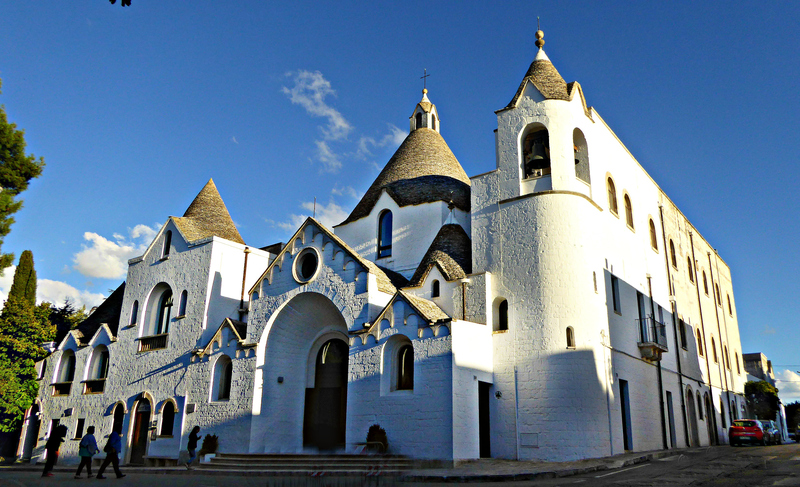 A trullo is made of limestone in a style of architecture unique to Puglia and to the Itrian Valley in particular. The rolling, Itrian Valley is criss-crossed with dry-stone walls and narrow winding roads. It is lovely to see the jaunty peaked roofs of the trulli, in various states of repair or disrepair, peeping out from amongst the endless olive groves and vineyards. 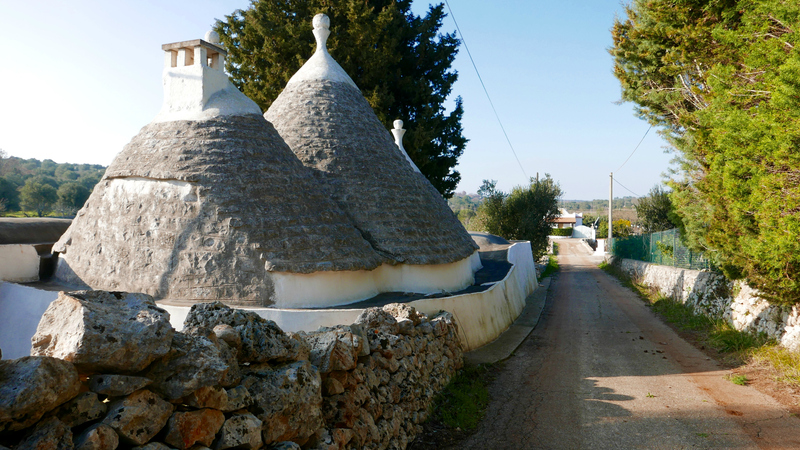 These quaint homes are scattered throughout the countryside, though there are many derelict trulli to be seen alongside the magnificently restored ones which are now used as holiday homes and rentals. As trulli are notoriously difficult to heat during winter weather, but are cool in summer when temperatures soar, they make ideal summer homes and have become popular with northern Europeans who have been flocking south to buy and restore them. However, there are many rules and regulations about their restoration as they are protected by UNESCO world heritage laws. 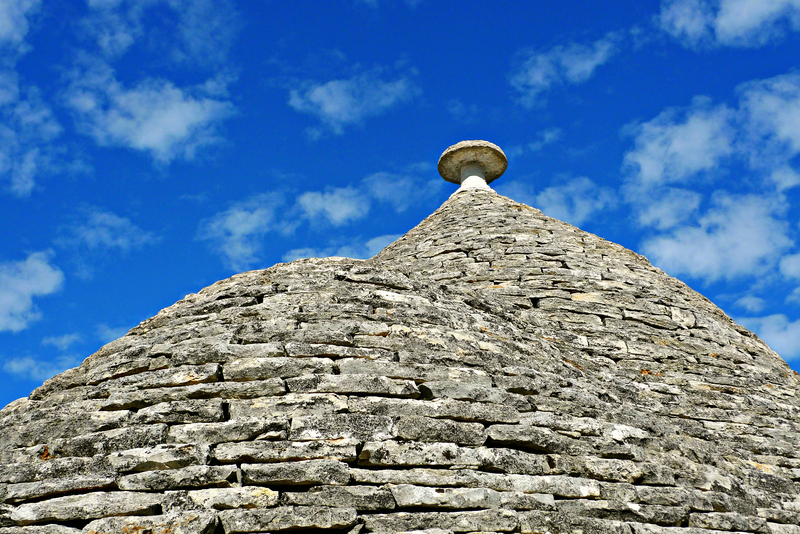 A trullo is built using a prehistoric technique in which small stones are laid on top of one another forming thick walls. No mortar is used. These stones were originally dug up when the owner excavated his cistern for storing water below ground as, on the Murgia plateau, the winter rainfall drains into fissures between the layers of limestone and there is no surface water. 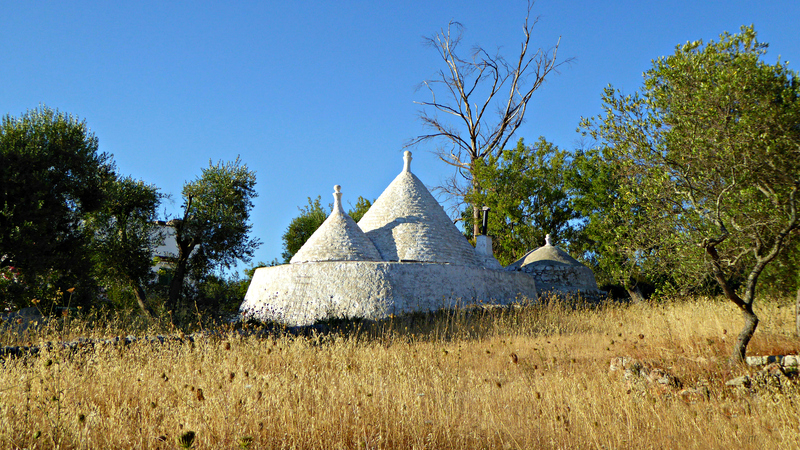 In the countryside trulli are built either singly or in clusters. Under each cone is one room. A multi-coned dwelling would therefore have several rooms. Heating is provided by an open fireplace and, originally, sleeping alcoves in the walls were covered by curtains. The cones are topped with hand-crafted pinnacles, usually ball-shaped. The story goes that trulli were originally built in this mortar-free fashion in order to be easily dismantled when the tax collector came around, but how true this is I have no idea. 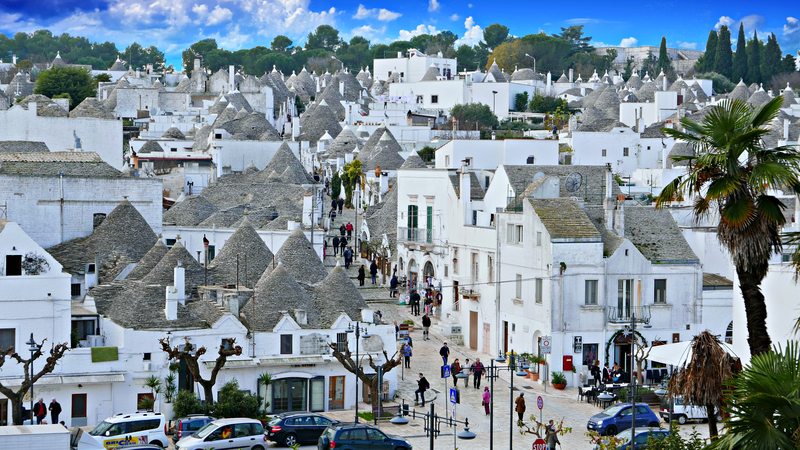 On visiting Puglia, the first thing most people want to do is visit the town of Alberobello where 1,500 trulli can be seen clustered together. In and around Alberobello, many of the trulli have symbols painted on their cones. These were added after the town was restored during the last fifty years and have various meanings, both religious and celestial. The trulli here date from the eighteenth, nineteenth and twentieth centuries. 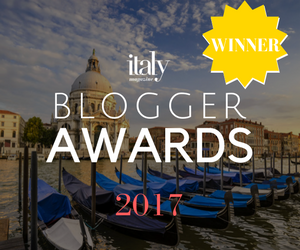 If you are looking for an unusual place to visit in southern Italy, it is well worth taking a side trip to see this remarkable town. The word “alberobello” literally means, in Italian, “beautiful tree”, named after an oak forest that once covered the area. Alberobello has been a UNESCO World Heritage site since 1996 and when you visit there you will know why. Even though it is the most touristic spot in Puglia, it is worth seeing for its uniqueness alone. Climbing steeply upwards through the quaint streets, it is interesting to see that many of the original trulli have been transformed into souvenir, coffee shops and B&Bs. Clustered tightly together, the little houses are delightful and the huge trullo church is, to my mind, a stunning feat of architecture. 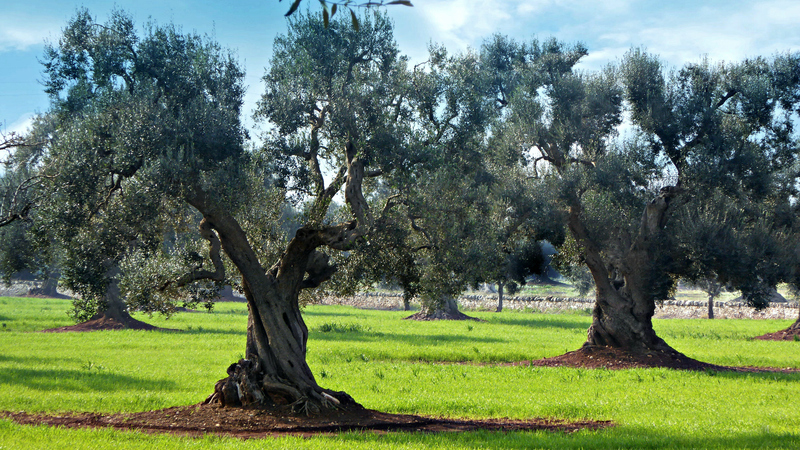 All in all, the Itrian Valley in Puglia should be on everyone’s list of ‘must see’ destinations. Quite apart from the trulli, it is a uniquely beautiful area, populated by super-friendly people, an unparalleled food and wine culture and, with its multitude of sandy beaches, has something to offer all the family. How to get there? 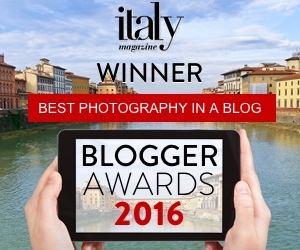 Just fly to Bari or Brindisi. I had the great good fortune to visit Puglia and Alberobello, etc. last Spring. A wonderful unique area. It is unique for sure. We love living here…. it’s such a special place. Glad you agree! You won, you won!! I’m so happy for you!! I loved this post as well. I would really enjoy visiting here. My favorite shot is that third one, the left photo. 🙂 Happy 2018 to the two of you. I love Puglia! I’m returning every year in May or June. Often to Gargano. Amo Vieste e Peschici. Amo le spiagge e la foresta umbra. Sempre meraviglioso. Ci vediamo?